Creating a QR code for a business card may sound like a challenge. Truth is that everybody can create a QR code for a business card and the steps are quite simple. It is important though to understand the constraint of the task. You do not have much space on your business card because you will probably want to leave the text there as well. On the other hand the QR code that contains all your details may be quite big. Shrinking it to a small printing size might turn it to be not decodable. However following the steps below turns this challenge to be a quite simple task. If you want to put a QR code on a business card you have two options; one is to encode a URL to a landing page where all details are, including a link for saving contact to phone books. The other option is to encode all your details in a vcard or MEcard format so that they can be saved into contact books directly. Here is an example of same data decoded in a vcard and MEcard formats. Both QR codes are in Low EC (Error correction) which is perfect for business cards. Going into a higher EC will make your QR code grow, not a good idea when you are so limited in size. As you can see the MEcard format is much more compact. The version of the vcard created QR code is 9 (53×53 modules), where the MEcard version is 5 (37×37 modules). Readers will be much more comfortable with the MEcard format – the QR code modules are bigger in size which makes it easier for readers. Whenever a QR code is printed it is important to make sure it has a quiet zone around it. Look at the white ring around both QR codes in the image below, this is the quiet zone. It should be at least at a two modules width. The QR code spec requires four modules but all readers work perfectly with two as well. The width a QR code module (black or white dot) should not be below 0.027 inch (or 0.7 mm); otherwise some readers might not be able to read it. Using this minimum size the MEcard will be printed on an area of 1.02 inch (2.6 cm), while the vcard QR code will be 1.43 inch (or 3.6 mm) which may be too big to be printed on the front side of a business card, it can however go to the back side. How do I know what version is my code? A simple way to detect the version is to count how many black modules are in the timeline. Every QR code has two timelines one is horizontal and the other one is vertical. The time lines are on the bottom line connecting the horizontal finding patterns and on the rightmost bars connecting the vertical finding patterns. The time lines are identical in content so counting one of them is enough. Here we have 11 dark modules on the timeline (colored red). To get the version subtract 1 and divide by two, (11-1)/2 = 5 here the version is 5. To get the number of modules for a version – multiply the version by 4 and add 17. Here 5*4 +17 = 37 modules width. Check that the total width of your printed QR code divided by number of modules is no less than 0.027 inch. If this is ok your QR code will be decoded by common readers. Why is this? The 0.027 inch per module is a size that will focus with almost all common cameras on smart phones today. The 7% spare that the Low EC provide should be enough for every reader to overcome the impurities of image capturing – assuming that you do not draw on your QR code. This group lets you choose the EC (choose Low) and supports both vcard and MEcard formats. I do not mention here other QR code generator that creates by default codes in higher EC level, since the QR codes versions tends to be bigger, which is not good for our case here. Is decorating the code an option? Yes it is – but do not draw on the QR code. You can color it; just make sure that the color has enough contrast with the background. When size is so small for every module I will be careful when rounding corners or adding other effects. If you use a URL to a landing page (and if you shorten it) you will probably have a small version of QR code, which means big modules in print. In that case you can try to create a QR code with a Medium or even Quality EC level and add effects or even draw a small logo on the QR code -do not exaggerate though, size is still an issue. Make sure that your QR code has a quite zone of at least 2 modules around it. That means that text should not reach the envelope of the QR code. This might cause some readers problems in reading your QR code. See if you can print your QR code image in a vector format. Vector formats enables a smooth shrinking of QR code size on print, without compromising on image quality. Popular vector formats are – SVG, PDF, VML and EPS. Some QR code generators enables saving the QR code image in one of these formats. If you prefer working with jpg or png formats check that the final printed barcode does not suffer from too blurred borders. Test your printed code (in real final size) with one or two readers – just to make sure there are no surprises. No need to test with more readers, if you followed these simple rules most readers will read your code without problem. Not all readers support the adding to contact books feature. Also note that on the iPhone some readers will not support the add to phonebook link in your landing page, in case you chose to put a QR code with a URL pointing to a site with your details. On Android devices – QuickMark supports only the MEcard format while QR Droid, Barcode scanner, Beetag, i-nigma, Red laser, Lynkee and scanlife supports both formats. So it looks like readers support more the MEcard format, which makes it the preferable choice for direct booking on a business card. 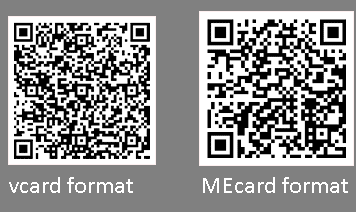 By the way in case I forgot some popular reader or a vcard/MEcard QR code generator, please let me know, I will gladly add it – it may help to make the process even easier. This entry was posted in create QR codes, error correction, MEcard 2D code, print QR code, QR code business card, QR code generators, Qr code usage, vcard 2D code and tagged create QR codes, error correction level, MEcard Qr code, print QR code, Qr code business card, QR code generators, vcard QR code. Bookmark the permalink. Hi, I use Lynkee on my Android Nexus S (before on my and Blackberry 9700) and it works perfectly. Thanks John, good to know. I added Lynkee to the Android list. Hi Eismann, thanks for a really useful blog. You mention here putting a method to save contact on a landing webpage, rather than encoding it in a QR code, and just having the URL in the QR code. I would love to do this, but I can’t work out any way to craft the landing page so that an Android or iPhone will allow it to be saved. Do you have any method of doing this? Would separate pages be needed for each OS viewing it? Normally putting a ‘save to contact’ link in your landing webpage should work for Android devices, providing that the link points to a .vcf file. iPhone devices need an app to register for controlling the .vcf file in order to download it, for example on IOS the Whatsapp application will take care to save your .vcf file into your contacts. In any case there is no need to design different web pages for each device.